Allison Kocis and I had met through work. Allison started working a while after I had, so we were shy at first to talk. Once we got to know each other, we quickly became good friends and shared stories and laughter. When I first met Allison, I didn’t think she would quite have a story. When I asked her if she would participate in my project she gave me a little briefing on what it was going to be about and I was astounded. The life Allison had did not show on her face, or with her emotions. I was very excited to finally sit down with her and talk about the story she had written out for me. I hope you enjoy Allison’s story as much as I did. As you read on, know that it wasn’t exactly easy for Allison to repeat these words, but she was also excited to finally tell her story. In the town of Streetsboro, Ohio, Allison and her sister, Emily, never got along. They argued and fought constantly, leaving Allison very sad and lonely most of the time. Emily was always the louder rebel one, whereas, Allison was the quiet and sensitive one. Emily resented Allison for never getting in trouble, often trying her best to get Allison in trouble. Little did she know, things change quickly. Allison was shy and quiet, like most girls at a young age. She didn’t have a lot of friends. Mainly because she would spend almost every recess alone, thinking it was normal, until she told her mom. Her mother was upset that her daughter was purposely spending time alone, but Allison just didn’t know how to really talk to other kids. She didn’t mind being alone; most of her classmates were mean. Typical schools. She had gotten her “first boyfriend” in sixth grade. His name was Austin and she really liked him. They were together in a sense of just smiling at each other and hanging out during recess. About a week later there was a note on Allison’s locker. Austin said he was getting made fun of by his friends for being with her because she was smart and not that pretty. It upset her greatly. She cried, went to the office, where her mom conveniently worked at, and told her everything. To Allison’s embarrassment though, her mother approached Austin while the whole class was in the library. She scolded him for the way he treated Allison and everyone was laughing. At that point, Allison felt alone. Allison even went up to him and apologized for her mom’s behavior. During Allison’s middle school years, things started to get really bad between her and Emily. When she was in seventh grade, Emily was beginning her freshman year of high school. They were both changing and growing up, but in such different places in life. They didn’t understand each other at all. It seemed they were possibly not related. Emily always had a very bad temper and Allison was always very sensitive. Those two things did not mix well. Allison started playing the trumpet in her school band in fifth grade, but didn’t really feel the excitement of band until middle school. Allison followed in her father’s footsteps, being extremely close with him when she was little, and decided to try out instruments, thinking she was going to play the trombone just like her dad. She felt the trombone was too big for her, leading her to pick the trumpet. Allison loved her school and began making a lot more friends because of band. This was when she met her director, Mrs. Ellsworth. She didn’t know it at the time, but Mrs. Ellsworth ended up making a huge impact on Allison’s life. Mrs. Ellsworth was a very fun teacher and she understood her students. She demanded respect, and she got it, but she was very loving. Allison was happy during her first year of middle school. She loved her teachers, had fun in her classes, and made a lot of friends, which brought her out of her shy shell. She had one or two crushes, but nothing that affected her. Eighth grade was good and bad for Allison. She was still attending band, loving it, but getting older led to more stress and drama. She had little arguments with her closest friends, which to someone in middle school seemed like the end of the world, but they always ended up okay. She gained and lost friends that were dear to her. They found other people with more things in common and just left her behind. The people that did stick around grew close to her. She had her first “realish” boyfriend named Nick. He was nice for a while, the first boy she had ever held hands with. He would walk her to the bus everyday and she’d kiss him on the cheek before she got on. One day, he just stopped talking to her. She was with her friend one day and her friend called him to ask what was going on. He said he didn’t like Allison anymore. He didn’t know Allison was standing right by the phone until he heard her start crying. She felt embarrassed because another relationship had ended. Allison had become very insecure that year. The days where she saw being alone wasn’t a problem were over. She saw every flaw in herself and lost so many friends to people who weren’t the best. She was made fun of and was avoided because she was a “dork.” All of this really got to her. She started spending all her time alone in her room. She would listen to her Killers CD’s, which was her favorite alternative band, over and over again. She was tired and music seemed to be the only thing that she could relate to. To this day, it’s the only thing that never fails her. It keeps her going. She didn’t understand why she wasn’t sleepy, just tired. She was exhausted with life and she was only 13 or 14 years old. She grew up during the time where cutting and being “emo” were phases in most people her age, but Allison wasn’t “emo.” She didn’t cut, so she thought she was fine. She would only go downstairs in her house to eat with her family or if they were going somewhere. She continued to lie in bed, listening to music for hours. Her mom had asked if she was okay and her father told her they missed her, but she was annoyed with everything. She just wanted to be alone. The beginning of freshman year was the beginning of marching band. This was great for Allison. She went to practices all through the summer, went to band camp, and made a lot of friends. They were upperclassmen too, which made her feel more welcomed in high school. Band camp was her favorite time though. She attended the camp Muskingum. At this camp it brought all of them together. They spent hours every day marching and then broke off into their instrument section. While she was having a great time at band camp and in school, things were getting worse between her and her sister, Emily. Allison didn’t know this at the time, but her sister was really jealous of her. Allison was having so much fun, making friends, met Jerid, had her first kiss, and all these things Emily didn’t have her first year of high school. Emily had her boyfriend, Tyler, and they fell in love hard, so fast, but she was still upset that Allison had gotten all those things earlier on. Freshman year was when Allison’s depression started getting worse. She realized that it wasn’t okay to wish she wasn’t alive and that she was so tired of everything all the time. When she was having a panic attack or feeling down, she would call Jerid, her boyfriend, because she just wanted him to say something, but he always would say, “I don’t know what to say.” That made her feel horrible. She just wanted him to say anything, even something cheesy like it’ll all be okay, but he didn’t. She still convinced herself that she couldn’t live without him. She thought he was the only one who could ever love her, despite all the negative remarks from her family about him. He wasn’t a gentleman. He wasn’t mean to her, but he thought highly of himself and let everyone know that. He never went to her door to pick her up, he would just wait in the driveway. Little things like that bothered Allison’s family, but he was her first love and she was blind to it for a long time. Allison had met Jerid in band. He was two years older than her. She didn’t like him at first, but he grew on her. He asked her to homecoming and they went with a group of friends, so her parents couldn’t consider it a date, since she wasn’t allowed to date until she was 15. That night was when she had her first kiss right after “The Only Exception” by Paramore played. They were a good couple for a while, a long while, three years to be exact. Every year in band it was very hard to see the senior class graduate. The band actually played the music for graduation and every year people would be sobbing because they had to watch their best friends cross the stage, out of their lives, and into the next step. Allison was one of those people, crying for her friends’ departures. Despite all of the good things that happened to her, she still felt alone. In her English class, they had a poem project and Allison was at a really low point that year, so she used it to vent about her emotions and experiences. She put so much feeling into it and she was proud of it. One day her mom decided to read her poems and she was very concerned. They were all sad and angry, which her mother never realized that was how Allison felt. Allison blew it off and told her it was nothing, that she was fine, but in truth, she wasn’t. She found comfort in being alone, locked in her room, but it was a strange feeling of loneliness, not wanting to be around anyone. It was an endless cycle. To this day, she still has every poem she has written. Sophomore year was the year when some of Allison’s dark secrets came out to her family. She was cleaning the garage with her sister, unpacking things from the car, and they had gotten into an argument. One thing led to another and she said something like, “I would kill myself before ever having to deal with this anymore.” Her sister just looked at her, walked out of the garage, and went up to the house. Allison knew she was telling their mom, probably exaggerating to get her in trouble. These letters explained how alone and misunderstood she felt. She remembered writing them as if they were letters to her family, pretending that maybe one day she would give them to them, or that if one day she did end her life, they would know why. When Allison met her sister and mom at the house they had a long talk. Emily got mad because most of the issues Allison had were caused by the things Emily had done or the way she treated her over the years. Emily just got up and left. Allison didn’t want Emily to feel guilty; she just finally had to get everything off her chest. That night Allison’s mom made her get the letters and bring them downstairs for her parents to read. Her mom cried and her dad was silent. The letters explained everything that Allison wanted her family to know. She wished she had kept them, but she threw them away because she wanted to feel more powerful. This year was also the year that Jerid and Emily graduated. 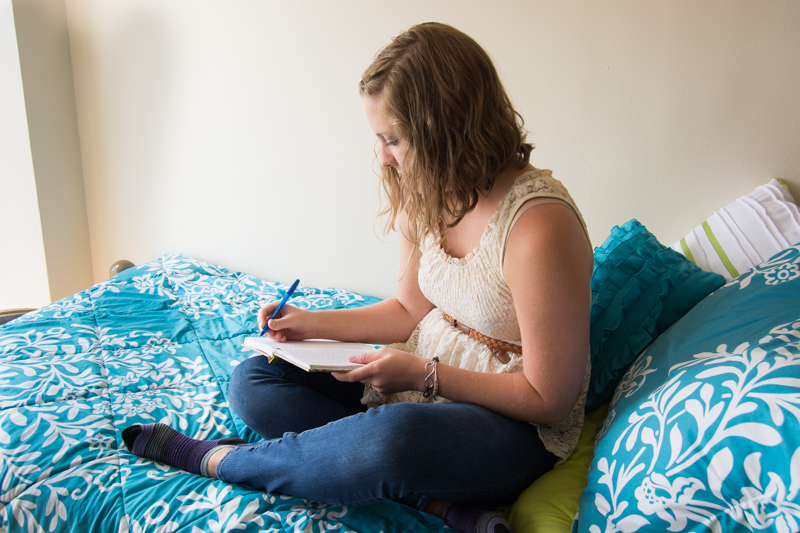 Emily commuted to college from home, so their relationship didn’t really change. Allison was so afraid that she and Jerid would grow apart because he wouldn’t be in high school with her anymore. She was so upset the night of graduation, but realized throughout the summer that they would be okay. They would hang out all the time and things seemed to be going really well. Junior year started out the same as her sophomore year, but things started getting better. She was fine without Jerid at school and while her classes were very stressful, she had fun. She was convinced Jerid was the one for her and that summer was the best she ever had. She thought she had her life figured out. She decided to go to the Art Institute of Pittsburgh for baking and pastry because she’s always loved food. Then she would graduate in less than two years, settle down with Jerid somewhere, and get their lives together. He went to the University of Akron for engineering, so he wasn’t too far away. He was close enough for visits to Pittsburgh. She never thought she would have to worry about finding someone else to love her. After a fun summer and a good year, Allison was excited for her senior year. She would have fun in school, graduate, and be free. About a month into her school year, she was noticing a change in her relationship. She didn’t miss Jerid and they hardly saw each other. She found herself getting annoyed with the things her family had complained about for years. They always said she deserved better, and Allison was finally realizing it was true. Allison was growing up and changing, but Jerid wasn’t growing with her. She denied this for a few months, and those months were really hard for her because she was fighting with herself. Allison’s depression came back ten times worse than it had ever been. There were days she would sit on the bathroom floor with a bottle of pills, opening and closing it, because she was so done with everything. She wanted it to be over and decided that would be the least horrific way to go. She was ready to stop feeling the pain. She would do anything to just make it stop. She knew people cut, and they described it as a feeling of relief, and she craved that. So it began. It started off with anything she could get her hands on, something sharp enough to break skin, to bleed, to release the hurt. Then she started using a pocketknife her parents got her as a gift. She would always cut on the outside of her upper thigh so nobody could see. There was one instance when she was lying in bed with Jerid and his hand was on her hip. The raised lines of scabs caught his attention and he looked. He asked her what they were and she just said they were nothing. He dropped the subject and never said a word about it. He had to know what they were, but he didn’t try to help her, he just let it happen. She wanted him to feel concerned, a part of her wanted him to push and ask, but he didn’t. Allison finally decided she had to do what was best for her. On their third anniversary Jerid said he had planned something special, so Allison dressed nice. He took her to the bowling alley. That was it. They had fun, but it was just the average evening they would always have. Allison was embarrassed when she got home and her family asked about their night. She wasn’t hard to please and it wasn’t that he wasn’t good enough, but she was hoping for more. He just stopped trying, he never tried too hard in the first place though either. She was sick of giving their relationship her all while he sat back and took all her love and gave her the bare minimum. She told him that and he begged her to let him try again. He said he wanted to go out to a nice dinner, dress up, and be romantic and he was going to make reservations and make it a great night. She said okay, but inside she knew it wouldn’t change anything. They got to the restaurant and it was closed. He lied about little things like that all the time. This time it really bothered her. That was his chance to make it up to her and he couldn’t even go as far as make a reservation. He didn’t make her happy anymore, just annoyed. He knew something was going on and they had a long talk. Allison couldn’t stop crying. She was sitting there with him at his house, in her favorite dress, with tears streaming down her face. She told him she had to go home. There were tears in his eyes when she told him she couldn’t do it anymore. He told her to go home, calm down, and talk to her mom about it, which she did. The drive home was only five minutes. She was crying so hard she probably wouldn’t have been able to drive much further. She walked into the house calmly and the second she made eye contact with her mom, she lost it. She remembered the first thing she said as she was walking up the stairs towards her mom, “Mom, I think I broke up with him…” Her mom was taken by surprise because she hadn’t hinted to her about any of it. She said she wished Allison had told her about the way she felt so she was prepared for this day. They talked for a long time and decided that Allison made the right decision. Allison then called Jerid and told him that they were done. It was really over. That night Allison tore down all the pictures and gathered everything in a box. Her mom laid with her until she fell asleep. Waking up in the morning after the break up was a strange feeling for Allison. There was no good morning message, nothing. It was really over. That day was uncomfortably quiet as Allison remembers it. Everyone was trying not to bring something up that might upset her. She knew she was the one who ended it, but it still really hurt her. She doesn’t regret her decision, but it still gets to her sometimes. It was the hardest decision she’s ever made. She slowly got back to her daily self, thanks to her friends who supported her the whole way. They were always prepared with words of wisdom and hugs for her. That was the first year Allison had to worry about finding a date to homecoming. She ended up asking her best friend, Traig, to go with her. She was terrified she would get upset, seeing all the couples dancing together, imagining it was her and Jerid, but to her surprise, that dance was the most fun she ever had. Traig knew how to dance, so he spent the night trying to show her how to dance and during the slow dances he held her close. The rest of the year had gotten easier for Allison. The first few months were the hardest. Everyone was slowly passing the news on from one person to another. She remembered at the first football game after the breakup, Jerid went. At that moment Jerid looked up at her and mouthed, “are you okay?” but it was clear that Allison was not okay. He went to several more games before Allison’s best friend, Quintin, told Jerid he needed to leave. It was too soon for Allison to see him. She needed time. He didn’t go to any more games that year. There was a time when Allison asked Jerid if they could try one more time, but that didn’t go over too well. Graduation for Allison was as emotional as it was when she watched the upper classman do it, but that time, it was her. She remembered being really nervous because she was on the stage and she was in the top ten of her class. She kept turning to face the band, who were seated behind her during the ceremony. She would make eye contact with Quintin or Traig and see them cry, making her cry as well. As soon as it was over, Allison briefly said hi to her family, then rushed back to the stage where her band family was waiting. She saw Quintin and ran to him. They hugged so tightly, sobbing the whole time. When she saw Traig, with tears in his eyes, she was so sad. She knew he was upset that they wouldn’t be seeing each other everyday anymore. She was hurt about that too. Graduation was hard for her, but she also felt relieved of all the stress and drama that was involved with high school. For once, she wasn’t afraid of change, she was excited, and ready for the next chapter of her life. This year Emily and her boyfriend of four years broke up. Her boyfriend, Tyler, changed a lot and wasn’t very nice anymore. They fought all the time. Emily had a very hard time coping. Allison had never seen someone so broken and defeated by another being. She was there for her though, being through her own break up, she was able to help Emily and reassure her that things would get better. While that situation broke Emily, it brought the two sisters together. They practically became best friends over the summer. Allison arrived in Pittsburgh to begin college in August of 2014. She loved her roommates and a lot has happened since then. She believes she has finally found where she belongs. She now lives with her friend, Samantha, and she doesn’t know what she’d do without her. Right now both of them are in their third quarter of lab classes. They are in their first baking class now called Pastries, which is nice because unlike the cooking classes, they get to make pastries, which is what they are going to the Art Institute for. The classes are a lot of fun, and while they can be intense at times, Allison is amazed by how much she has learned already. 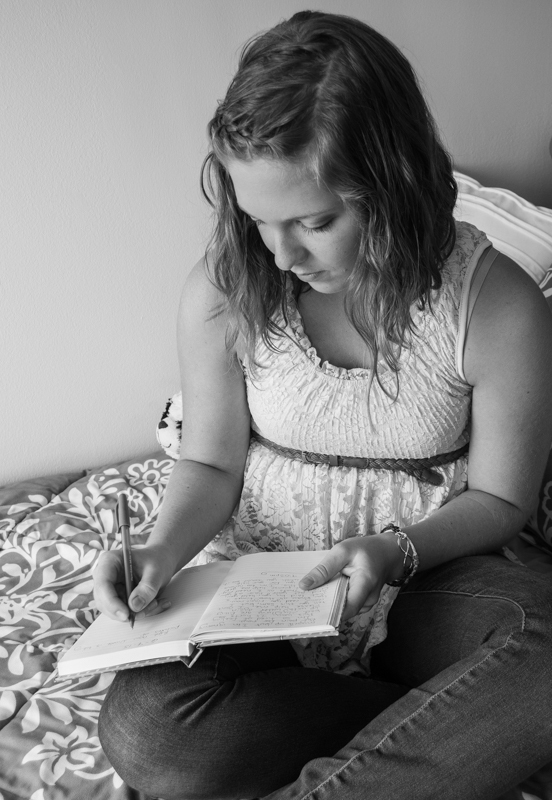 Writing has also become a huge part of her life. From the letters she wrote, to her parents, to the diaries and journals she’s kept over the years, it all adds up to be her story. She doesn’t know why she thinks it’s so important, but she doesn’t want to let a moment pass by where she doesn’t explain what it was like. She now works in the Writers’ Center at the Art Institute. She enjoys working there. At first she was nervous, but she joined in quickly. Allison is only 19 years old, and may have a few scars on her legs, but nobody knows what they’re from. It still gets bad sometimes, and she may pick up the blade as a last resort, but if that’s what it takes to keep herself alive, it is what it is. She is so much stronger now. She survived high school, heartbreak, and a loss. She’s proud of the woman she has become. She still has a ways to go, but she knows things will get better. She made it her goal to try and relax and just let life happen. Something I’ve learned to do as well. Thank you Allison Kocis for sharing your story. I know it was hard for you to rewind your memory back to those darker days, but know that you are not alone in this world. Everyone goes through some sort of pain in their life. Some only know the great extent of yours. The fact that you have defeated what once controlled you is amazing. You have proven that deep down there is strength in everyone. I’m grateful to be able to share your words. Your story will inspire many!